Crown Staffs & Crown Bone China - Antique Bone China Query: I would value your help on some china that I have please. The first is a set of Crown Staffordshire "Pan design", and the second is vintage Crown gilded with flowers all round and edged with dark blue and gold. The second set has Crown Bone China and the numbers 3578 and 3580. Having found you from the internet your information is very helpful and I would be grateful for any extra help from you. Many thanks for you inquiry and kind words. The Crown Staffordshire "Pan Design" set is the easy one. Crown Staffs (see my A - Z guide) are perhaps the best known of the many pottery companies with a "Crown" mark. As far as I know their "Pan Design" is not particularly rare or sought after. However, only an appraiser or Crown Staffordshire collector could confirm that. I am just going by the fact that recently, a set of 8 side plates sold online in one lot with a value of around £7.00 GBS ($10 - $13 USD) for the lot, not per plate. With regard to the "Crown bone china" query. It is impossible to say from the information you give which company you are referring to. There are 24 English potters alone who use the "Crown" mark and brand name. There are also several other American ones using the Crown pottery mark and trade name, not to mention French and German makers. The use of the words 'bone china' suggests an English maker though. In addition, the fact that there is no distinct name other than the word "Crown" suggests a lesser or smaller, less well known manufacturer who were trying to "big themselves up" by conjuring up some mythical regal connection, or alternatively, a mass producer trying to gain some false kudos. 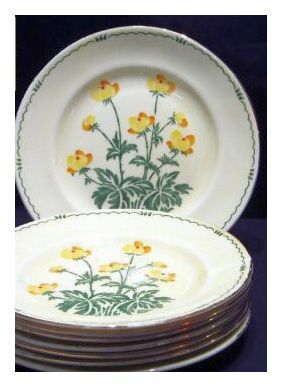 However, it is possible you forgot to tell me the set was actually marked as "ROYAL ALBERT CROWN CHINA" (one of the ways this illustrious firm backstamped their wares) - in which case you have a nice heirloom! Staffordshire, yellow, purple and blue flowers on cup. and saucers. Hello, I also have a tea service with no indication of design but stamped Crown Bone China then a crown logo and below Made in Egland. The set is very pretty thought to be Edwardian, so perhaps before retailers used more specific names? White background, orange and red flowers with brown leavesand a little green. Broad royal blue band and gold on a fluted cup ege, plates are square with fluted edged. All tea cups are stamped in gold 3580 all other stamps are in green. Any ideas?